This is the beginning of a series of reviews meant to be up much much later. Well, they really ought to have been done up long time ago. Life’s such an irony I know. Just earlier, I read an entry on someone’s visit to Pierre Herme in Paris and his take on the French pastry master’s macarons, analogising it to one of life’s many first times, those viriginal encounters which change one’s perspective of things and never to look back at the old ways again. That most certainly struck a chord which resonated deep within as I recall those precise moments, one of which was fairly recent. Not with Pierre Herme though, but at Sadaharu AOKI’s dessert boutique in Taipei last year. We planned the trip way before the actual date, as we do with most of our overseas excursions, ensuring that our itineraries would allow us to maximise the experience with the minimal amount of time we had. Been to Taiwan for a number of times now, this was my first visit to experience the country’s pastisserie scene. We had a number of places in mind, from smaller and more local dessert shops and cafes, to international names like Joel Robuchon and Jean Paul Hevin’s joints which recently anchored in Taipei. 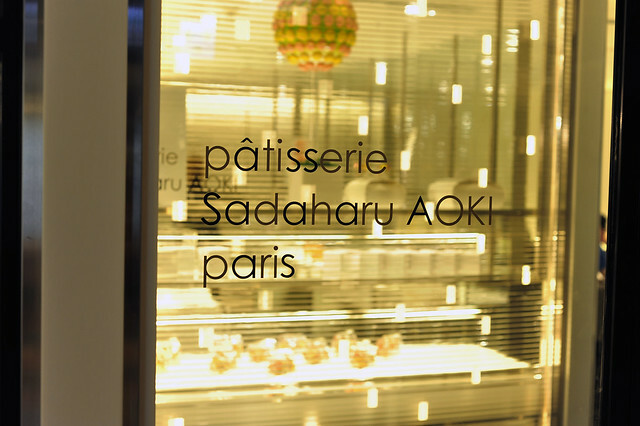 However, top on our list were the two dessert salons by Sadaharu Aoki. As some of you already know, I’m a big fan of his work, with attempts to reconstruct some of his creations. But his pastries and desserts remain elusive and somewhat mysterous, with very little recipes in circulation. Even those which are going around the internet and even publications are somewhat dubious in terms of their genuinity. So this trip to Taipei was the perfect opportunity to experience firsthand how his masterpieces are like. And sampling we most certainly did. This would definitely go down as one of life’s many first times. Konnichiwa Aoki san, Hajimemashite, dozo yoroshiku onegaishimasu!